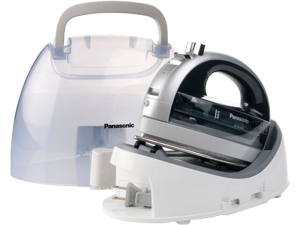 Cordless 360° Freestyle™ Steam/Dry Iron with Curved Stainless Steel Soleplate, Multi-Directional Design with Added Steam Vents, Auto Shut-Off, Adjustable Steam, Electronic Temperature Control, "Stay Clean" Steam Vents and Anti-Drip System. "The wireless option is fabulous, the irons amazing; steam power is incredible. My ironing is half the time it used to be. The design is perfect and the handle size is great for my small hands yet just as comfortable for my husbands big hands. I love this product and honestly am planning on purchasing a few as gifts to friends and family." I have used this iron now for about 3 weeks. It heats up great, light weight. easy to use. Does not take long to reheat once set back on the base. This was the first one like this I have every bought. I got it for pressing quilts after piecing. It is so nice not to have a cord drag over the quilt.